I think that I am, in many ways, different from lots of folks. And I’m OK with that. When our kids were small they had t-shirts which showed a group of identically marked fish, all schooling in the same direction, and one very little fish, differently colored, swimming in the opposite direction. The shirt proclaimed, It’s OK to be different. I should have such a shirt. And, so it was, that I was washing the dishes after dinner this evening when I happened to look out the picture window to the north-west and saw that the setting sun was casting an eerie yellow light which illuminated the remaining clouds of a weather system which was moving quickly to the north. Joanna said, That’s pretty, why don’t you get your camera? I replied, What’s so pretty about a jaundiced, yellow, sky? I don’t know why, but I made my way back through the kitchen and on to the living room for a view in the other direction, to the south-east. I turned the corner and took in the view for perhaps less than a second, and ran upstairs to grab my camera. I was down the stairs, negotiated the hall, through the kitchen, and out the back door having switched on my camera and put on my shoes. I stopped, cranked my 24-70 all the way out, and took a look … damn … not wide enough. So I began to run down the driveway. After putting myself 100 yards further away from the beautiful, double, rainbow I brought the camera to my eye again … damn … the increased distance didn’t seem to make much of a difference. I turned and ran the remaining 900 yards to the very bottom of the drive, and brought the camera to my eye. Damn and blast … the view looked just as it had the first time I had checked, just outside my back door. Without attempting to figure out the physics of the situation, I dialed in the appropriate exposure, composed as well as I could and squeezed off four shots before the sun fell below the horizon behind me, putting an end to the show. I walked, dejected, and swearing, back to the house. My shoes were full of water and my pants were wet to the knee. Joanna greeted me at the back door and asked, Wad-ya get? I said, in as sarcastic a tone as I could muster, A nice fractional view of a rainbow. I learned two lessons this evening. 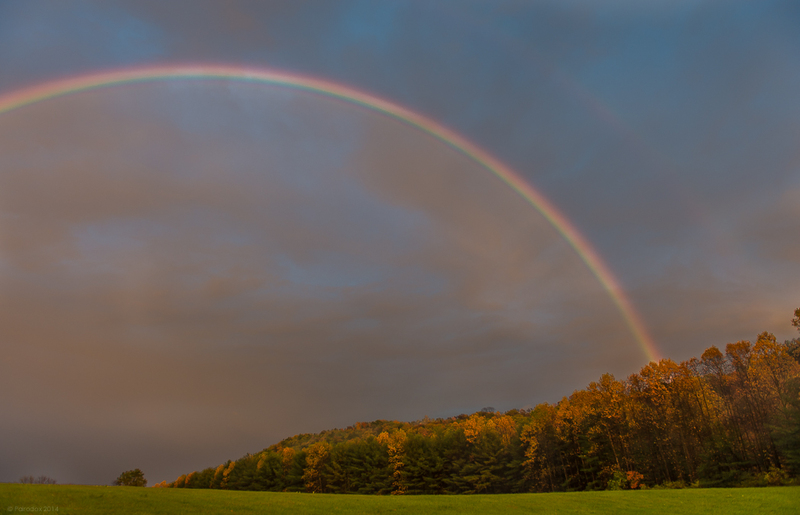 1) You should never, ever, try to photograph a rainbow without first grabbing the widest piece of glass you own. I have a 14-24 which would have been perfect for this shot, but I didn’t take the time to grab it out of my pack. Big, big, mistake. And, 2) One should never, ever, under any circumstance try to run away from a rainbow to gain a wider field of view, for it doesn’t seem to be possible. There are at least two followers out there who I know of who I hope will enlighten me as to why this may be so. Thanks in advance. POSTSCRIPT: If you are interested to know why the rainbow did not recede as I ran away from it, click the title to this post. Scroll down to read the superb explanation provided by Elke from Theory and Practice of Trying to Combine Just Anything. She has provided proof of what Joanna has always known to be true, and that is You can’t ever catch a rainbow.